After rave reviews and an extended season at Perth's Fringe World Festival in 2015, Perth based theatre company, The LastGreat Hunt, have brought FAG/STAG to the Melbourne Fringe Festival. 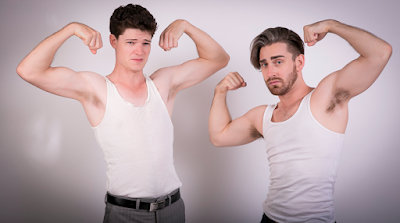 Written and performed by Jeffrey Jay Fowler and Chris Isaacs, it is the simple story of two best friends, one gay and one straight, who are going through some pretty challenging times in their lives. Jimmy (Fowler) and Corgan (Isaacs) each take a seat on opposite ends of the stage. At their disposal, they each have a mobile phone (to check their dating apps, grindr for Jimmy and tinder for Corgan) and a PlayStation controller. Using these two items, they recall the moments of their lives leading up to their friend Tamara's wedding. Tamara also happens to be Corgan's ex-girlfriend. Corgan is still not completely over their break up and Jimmy has just broken up with his boyfriend. Life is great. As an audience member, I much prefer to be shown things in stories rather than be told. However, due to the overall style of the production, I was immediately drawn into FAG/STAG. Having been created through long form improvisations that were later recorded and transcribed, there is a genuine sense of vulnerability coming from the actors as they explore what it means to be a 20-something male in Australia who doesn't quite have it all together. The duologues are extremely natural in language and in delivery with the experiences of love, happiness, fear and sadness they encounter being so common that you cannot help but relate to them with your own. Fowler and Isaacs are not afraid to play with silence and allow the audience the time to fully comprehend the situations the characters find themselves in. There are some deeply honest and moving moments in FAG/STAG, where the effects of some stayed with me long after the show ended. However, there are many humorous moments in the show, as with life, and the ability that Fowler and Isaacs have in noticing these moments and bringing them to the surface is highly skillful. The final minutes of the show perfectly sums up what the two have been exploring and something which will now forever be linked to that iconic song for me. Just like life, not everything is completely resolved by the end of FAG/STAG, but you walk out with the hope that Jimmy and Corgan are better and stronger because of their experiences and perhaps so are we. Ultimately, despite our individual differences, we are all the same and we all share the same experiences and thoughts and it's important to be there for each other. Even if it's just to play Donkey Kong.